“during the fourth watch”; between the hours of three and six in the morning. There is very early morning sunlight, coming from the left of the picture, which is illuminating the scene. Notice Jesus’ sleeves & hair have yellow sunlight on there edges. The yellow sunlight is also visible as a feint yellow glow in the clouds. The lamp at the top of the mast casts a warm yellow glow on the mast, sails & disciples below. 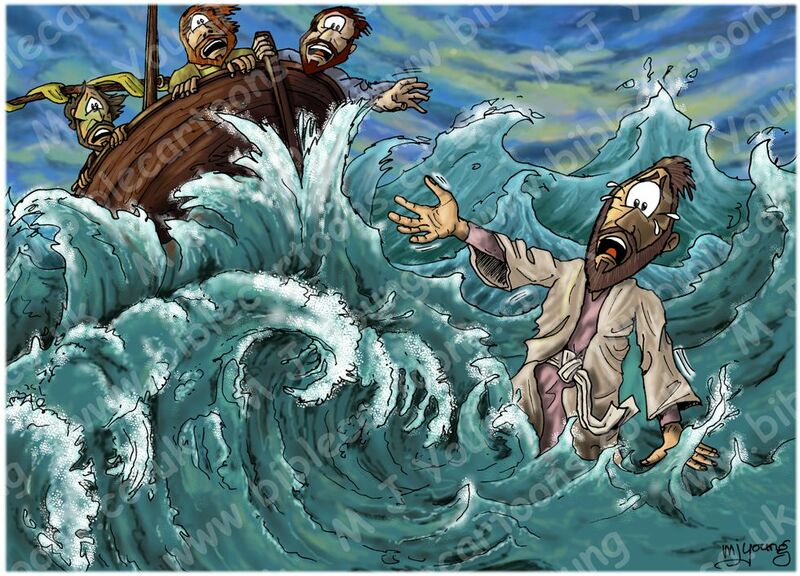 Note that John (son of Zebedee & brother of James), Thomas/Didymus (”Doubting Thomas”), Philip & Judas Iscariot are in the boat, but not visible since the boat is being pitched up by a powerful wave. 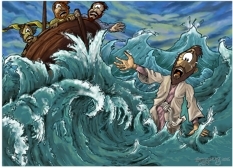 Note that Jesus the Christ is standing on the lake water, but is out of the scene, off to the left. I decided not to show Jesus in this scene, hoping to concentrate the viewers attention on the sudden fear of Simon/Peter as he begins to sink into the water. Notice his anguished outcry, tears & grasping hand that help to show his terror. I also wanted to show Andrew sudden impulse to reach out to try & save his brother, coupled with the gasps of fear from the other (visible) disciples. I really enjoyed drawing all that turbulent, frothy sea!